HMD Global Opens Bootloader Unlocking For The Nokia 8 - AndroGuider | One Stop For The Techy You! At the beginning of the year, I wasn't interested in any Nokia phone from HMD Global because I couldn't mod it. By modding, I mean flashing custom ROMs, rooting, using the Xposed framework and Substratum themes. HMD Global hadn't released the kernel source code for any of its Nokia devices and there was no means to unlock the bootloader. These two are the basic requirements for anyone to get started with modding their device. After receiving a lot of criticism, HMD Global finally began releasing the kernel source code of its devices in April. However, since the bootloader couldn't be unlocked, custom development wasn't possible then. Disappointed Nokia users filed several petitions on change.org requesting HMD to allow bootloader unlocking. HMD has given in to the demands of its users and the Finnish company is now allowing Nokia 8 users to unlock the bootloader. I hope that HMD will soon support bootloader unlocking for other Nokia phones too. 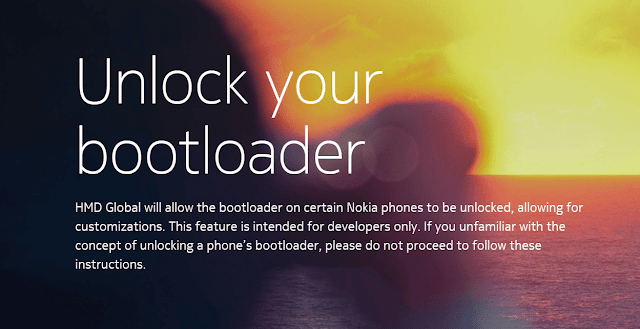 For the time being, the Nokia 8 users can click here to get started with bootloader unlocking. The procedure is similar to that of unlocking a Motorola device. You will have to request for an unlock key. Once you get the key, you will be able to unlock your Nokia 8 with a simple fastboot command.